The Moxon Antennais a simple two element parasitic array antenna that is popular with Amateur radio enthusiasts for its simplicity of construction. The design is rectangular, with roughly half the rectangle being the driven element and the other half being the reflector. 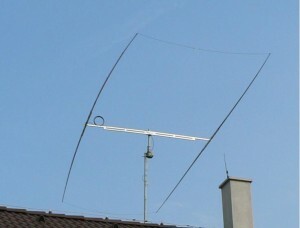 It can by thought of as a Yagi antenna with bent elements and without directors. Les Moxon, G6XN originally designed the Moxon Rectangle based upon a design by Fred Caton, VK2ABQ. L.B. Cebik, W4RNL optimized a wire version of the Moxon. The Moxon can be visualized as a 2-element yagi with the element tips bent towards one another. The tips are separated by an insulator creating a gap which is mostly responsible for the directive pattern unique to the Moxon. Small in physical size. The Moxon can be built using a very lightweight structure and wire elements, which will fit into a footprint about two thirds the area required for a conventional beam. You can see by the measurements above that a 20 meter Moxon is only 25 by 9 feet.